Quickly fix leaky faucets and running commodes. According to the EPA, a running commode can add almost 200 gallons of water each day into your system! Run your washing machine with full loads only. Avoid doing consecutive loads of laundry in a short amount of time. Do not use multiple shower heads at the same time. Consider a high-efficiency shower head instead. Take shorter showers. Fill the tub only as much as needed. 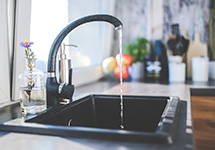 Turn off the sink faucet when not in use (such as when brushing teeth). Taking steps to reduce your wastewater may help with the life of your septic system (and can’t hurt your water bill). Make sure your family and guests are on board to keep your septic system running happy and healthy.